The Aztec King only appears on reels 2, 3 and 4 and substitutes for all other symbols except scatters. -All symbols pay Left to Right except (Scattered Idols),which pay any. -Win on fifferent lines from each bet line start on the left side. -Scatter wins are multiplies by total bet,line wins are multiplied by bet per line.Highest win only on each line. -Maximum win per paid is 50,000 time bet per line. 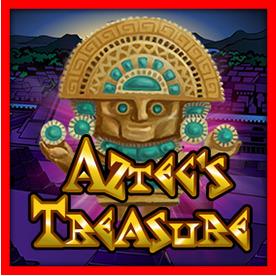 -In Aztec's Treasure's game, the bonus round consists of free spins. Wen 3,4 or 5 scattered Idols appearing anywhere triggers 5,15 or 25 free games respectively. Each scatterappearing during free games awards a BONUS PRIZE equal to the triggering bet. -A Progressive Jackpot can be won at the conclusion of any game. The Jackpot is triggered at random. Progressive Jackpot win are added to other wins. Random Jackpot contribution is no more than 1.5% of total return to player.